ShortScale :: View topic - I designed a new Mustang wiring diagram and I love it. 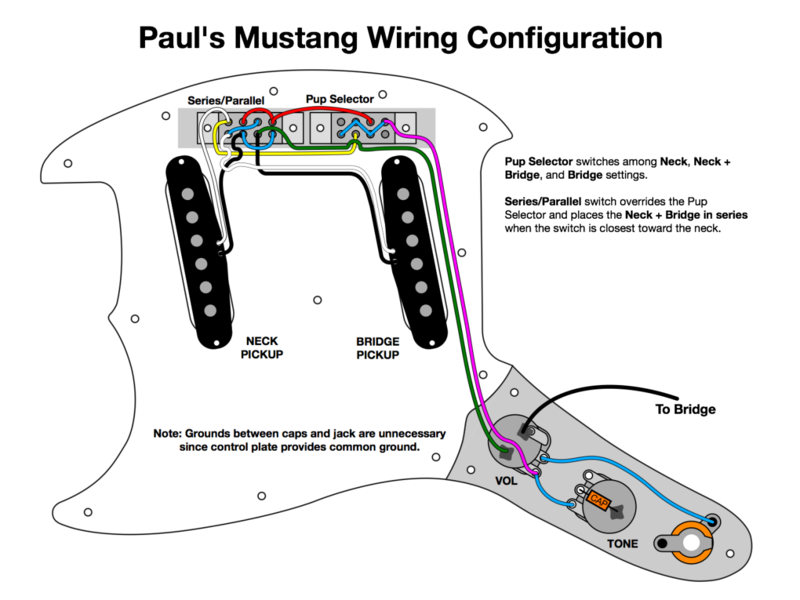 Posted: Sun May 17, 2015 4:00 am Post subject: I designed a new Mustang wiring diagram and I love it. I rewired my Mustang this morning, and I think it's finally perfect. My configuration replaces the bridge switch with a 3-way Pickup Selector (Bridge, Bridge + Neck, Neck), and it replaces the neck switch with a Parallel/Series switch (Parallel, Parallel, Series--yes, it's slightly redundant, but it's a Mustang), where in the Series mode, it completely ignores what the Pickup Selector says and just gives you glorious Bridge + Neck in Series. So this is something that's super easy to use and great to use live, because you can, say, use Series for a fuzz solo, and select a tone to switch right back into when you're done with your fuzz solo. No Morse code to try to figure out like most other Mustang wiring diagrams I've considered. Best part? Your guitar remains completely stock from the outside, and it retains the character of the Mustang while giving you that Series sound, which by the way is how early Duo Sonics were wired, but you probably knew that. Actually, even better part? Your guitar will never go silent unless you turn the volume knob down. You can finally be at ease with your guitar switches. The worst that can happen is you end up in another position. Your guitar will never turn off accidentally. By the way, if you don't like the redundant 3-way Parallel/Series switch, and have access to create a new pickguard, then you can route for a 2-way switch (like from a Jaguar) instead, and just eliminate the rightmost two terminals. If you must have phase options, then I suggest using a Push-Pull somewhere in the control cavity to reverse phase on the Bridge pickup, and have the output from the phase switch replace the Bridge pickup leads in my diagram. It'll cause a bit of a mess of wires, but that's how it goes. Or if you are building from scratch, you could always install another 2-way switch somewhere on the pickguard. The thing is I actually use the phase switch stock wiring on my Squire, even if I only use the bridge by itself. There is a difference: position towards the bridge gives a brighter sound, towards the neck gives a bassier sound good for some distorted sounds (all on just the bridge pickup, just reversing the leads/polarity). Not the same as using the tone control, but it certainly changes the tone. This also works on the neck or both pickups in phase. Does your mod provide the parallel wiring both ways too? You wrote that there are two parallel positions. There is actually like no theoretical basis for how a single pickup can sound different just by changing the winding direction. If that were the case Fenders and Seymour Duncans would consistently have one be brighter than the other since they're usually opposite in winding direction. In fact, the neck and bridge pickups are opposite in winding directions, too, so if your effect that you describe were real, it should work opposite one pickup and the other. But don't take my word for it. Ask any pickup manufacturer whether winding direction changes tone and they'd tell you it doesn't. Confirmation bias is hard to overcome, however. My two parallel positions are identical. I used to be the same opinion as you, and my Mustang was wired simply series/parallel with my (simpler) version of this mod. However, I did notice the difference when wired standard not too long ago, not only in Phil X's video, but also from my own Mustangs, both of which are now wired stock. It is much more obvious in the Squier than the vintage guitar, especially with distortion with the bridge pickup alone. I actually thought I did a video on this, but I haven't. I really don't feel like arguing over this, but even if there is a slight difference between settings, I'd rather have option for series, which anybody can tell is different, than phase, which we could have a long and fruitless discussion over and still not resolve. Actually you're right: my methodology was wrong. I was using my right hand to switch, and it's impossible to switch and go back to the same picking position exactly, so obviously it sounded different every time. I had to use left hand to switch (and it does feel awkward) and it sounded the same. That one looks cool. I have used the old JS one that had the tone pot bypass and all control bypass. Might have to give this one a try with my Mustang coming in. I have used the pickup selector mod before and I enjoy that simplicity. Yeah, I did a similar thing for my old Kurt Cobain Mustang, I had a selector on the forward switch and a coil selector on the rear switch. I want to wire up a HH Mustang soon with a 3-way pickup selector and a 3-way slide switch that does Inner Coil Split - Humbucker - Outer Coil Split. That would give a tremendous amount of versatility in a 2-pickup guitar. I've done something like it on a Jagmaster before and it was cool how you could get a quacky sound on the inner coils and a nice open rhythm sound on the outer coils. honeyiscool,Thanks, man! I'll do this with my mustang soon. And I want to set back stock pickups, no more humbuckers. Fender Mustang (SD Little �59 SL59-1b, SD Classic Stack STK-S4n). I did set my white Mustang up this way and dig it! I do like a 3-way toggle, hence prefering Duos, but this is a cool way of keeping the stock look. Great! I've used my setup for a few live performances and it's worked out well. I don't have it like the back of my hand just yet, but it's a pretty setup to remember, and besides, just the fact that I can always be guaranteed of having sound at all is a huge relief. Series is something that's just become necessary on all my single coil guitars. It's just a delicious sound, especially when using a dirty channel.